NEWESD 101 strives for continuous improvement in each our departments, and in all of the programs and services we provide. We attempt to constantly navigate north – to improve quality in professional practices and in student learning, with a prioritization on building respectful relationships with those we support. delivering essential, cooperative services to schools and other learning communities. NEWESD 101 service area: NEWESD 101 is responsible for the seven northeastern counties of the state, providing cooperative services in Adams, Ferry, Lincoln, Pend Oreille, Spokane, Stevens and Whitman counties. NEWESD 101 is the state's largest ESD in the number of districts served, counties served and geographic region served. Welcome to NorthEast Washington Educational Service District 101. Our team of talented and dedicated professionals embraces the opportunities and responsibilities associated with serving and supporting P-12 education in our region, and the various private, public and higher education partnerships that are an important part of the larger educational enterprise. We provide a wide array of programs, services and support to 59 public school districts, 45 state-approved charter schools, and two charter schools located across seven counties (Adams, Ferry, Lincoln, Pend Oreille, Spokane, Stevens and Whitman) in northeast Washington. We are also privileged to partner in programs that serve youth in the juvenile detention system, as well as young people who need and deserve options to pursue educational completion and career competencies. Assisting schools and other learning communities in preparing students across our region for success in the 21st century. Maintaining strong, supportive and mutually beneficial relationships with districts, schools and educational partners. Providing quality service and value. Blending entrepreneurial imagination and public service spirit. It is the nearly 100,000 students in our region, and the professionals who serve them, who are the very reason for our existence and who inspire the quality and breadth of our work. We strive, always, to navigate north…to continually improve and support similar continued improvement in student learning, professional practice and shared efficiencies. * Provide services to school districts and to the school for the deaf and the school for the blind to assure equal educational opportunities. There are nine ESDs in Washington, each serving a specific geographic region of the state. Click here for the Washington Association of Educational Service Districts. Washington's nine ESDs have evolved from a system that began as 39 individual county offices of education. In 1969, the county offices were replaced by 14 regional offices known as Intermediate School Districts, or ISDs. Later consolidation reduced the number of districts to 12 in 1972; then nine, in 1977. Five of the original 14 ISDs -- 101, 105, 112, 113 and 114 -- were largely unaffected by consolidation other than their eventual change in name from Intermediate School Districts to Educational Service Districts, or ESDs. While the number of ESDs has been periodically reviewed, numerous studies have recommended no change from the present nine. Legislative studies in 1982 and 1995 commended the ESDs for providing affordable, high-quality service to schools. In 2009, the ESDs were recognized in a 40-year anniversary celebration at the state Capitol in Olympia. ESD numbering system: As seen in the accompanying map, each ESD carries a unique identifying number, ranging from 101 to 189, that appears to follow no particular sequence. In fact, the numbering system was a product of the 1970s' consolidations. In 1972, ESDs 102 and 103 became ESD 123; and ESDs 106 and 107 became ESD 167. In 1977, the next round of consolidation turned ESDs 108 and 109 into ESD 189; ESDs 110 and 111 became ESD 121; and ESDs 104 and 167 became ESD 171. Locations: From its original home in the Spokane County Courthouse, pictured at right, the growing organization migrated to a pair of north Spokane locations in the 1970s and 80s before purchasing its current site on South Regal Street in 2001. A 5,000-square-foot educational conference/event center, behind the Regal office complex, was built the same year. In 2018, the agency expanded the event center with a 7,000-square-foot addition named in honor of former NEWESD 101 Superintendent Brian Talbott, Ph.D.
Agency name: In 2009, the organization re-branded itself to more definitively reflect its regional identity and commitments. 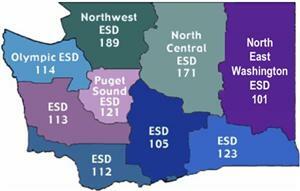 With "NorthEast Washington" added to its name, ESD 101 became NEWESD 101. Leadership: One of the most important and inspiring figures in NEWESD 101 history was board director Carl Putnam of Inchelium, pictured at left. Putnam served on the first ISD board in 1969 and remained a director for 28 years. Upon retirement, he was the longest-serving educational director in the state, completing 50 years of total board service at the local and regional levels. Putnam was a driving forcing behind the ESD's successful development of satellite television in the 1980s and its expansion in the 1990s. He was renowned for his commitment to public service, his dedication to rural schools, his vision, wisdom and knowledge. He remained an articulate and steadfast supporter of public education until his death in 2018 at the age of 101. Seven superintendents have led the agency through its history: Van Emerson, 1969-74; Ben Larson, 1974-75; Bob Price, 1975-81; Ed Luders, 1981-82; Brian Talbott, 1982-98; Terry Munther, 1998-2008; and Michael Dunn, 2008-present.